THIS. It's not unlike the real world. The problem isn't WMDs/Dragons. In the right hands, they can be guarantors of peace (Jaeharys I, The USA/UK/France since 1945, mostly). In the wrong hands, they can be terrifying (Night King, Maegor I, Kim Jong Un). The problem isn't that Dragons exist, it's that hereditary Monarchy is a system that is guaranteed to produce, every few centuries at minimum, somebody inherently unfit to rule. Daenarys, to her credit, seems to recognise this (hence all the "break the wheel" talk this year). Incidentally, in ASOIAF lore, while the Dragons lived, there was far more peace (the long reigns of Aegon I, Jaehaerys I, Viserys I, together delivering more than a century of peace) than war (the short reigns of Aenys, Maegor, and Aegon II, lasting the grand total of 11 years altogether). By contrast, after the Dragons died out, there was hardly a peaceful reign for any King. Daenarys summed it up nicely in this episode. When the Dragons died, the Targaryens were not extraordinary any more. If she loses Rhaegal and Drogon in the wars to come, any hope of long term peace is gone. That's why I don't think she will. I doubt that's the ending GRRM wants to write. The Targaryens have caused no more misery than any other House. Probably less than, for example, the Greyjoys, whose people have reaved and raped and stolen for centuries under Greyjoy lords and Hoare Kings alike. Did Tywin Lannister need a Dragon to drown women and children at Castamere? The Dragons aren't to blame, people are. And in a feudal society, Lords have to be kept in line. So long as there are ambitious and ruthless people with access to arms, only the threat of destruction will keep the peace. And the Targaryen dragons did that, until Viserys I screwed up the succession and set Dragon against Dragon. If there is to be peace in Westeros when this is all said and done, the only guarantor of that peace will be Drogon's fire, ready to rain down on those who would threaten the people. So I hope they'll survive the story. And I think they will. So what? WMDs are good. Don't forget that the most peaceful era in the history of the Seven Kingdoms was when Good King Jahaerys ruled wisely alongside Alysanne. And a f**kload of Dragons. When the Dragons died out, there was constant war and misery, and count 'em, five Blackfyre rebellions. I hate this assumption people make that all the dragons will die. That wouldn't be bittersweet. It would just be bitter. 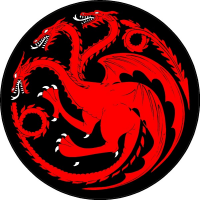 Plus, *if* the plan for the ending is someone from Team Targaryen on the throne, they'll be pretty toothless without the Dragons. On the topic at hand, it's plain as the nose on your face that Danaerys is the YMBQ. She is younger, more beautiful, and a Queen, and is planning to take everything Cersei has. Nobody else fits the bill. I don't mind a bittersweet ending, but I don't see an ending that is tenable or believable unless one side definitively wins the civil war. I genuinely think I've just seen the best episode of TV ever made. I'm shaking here. Wow.